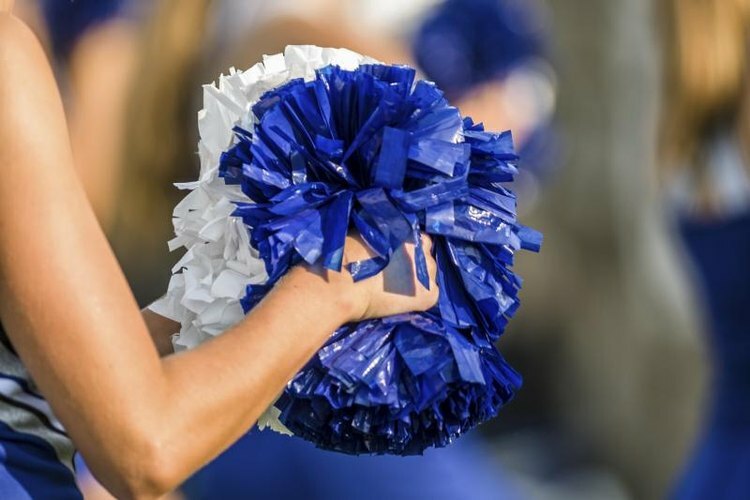 Cleaning cheerleading pom-poms should be cleaned regularly to keep them looking shiny and new. Pom-poms are manufactured in both plastic and holographic-coated plastic styles; or a mix of the two. Knowing what your pom-poms are made of is important for proper care. Shake out your pom-poms every two months to spiff them up. Read the sticker attached to the plastic handle of the pom-poms to determine what materials were used in their manufacture. Looking at the pom-poms also will aid in determining the materials used -- plastic pom-poms are one color per strand and holographic pom-poms are iridescent and smoother to the touch than plastic. Spray a cloth rag with Windex or a similar cleaning agent designed for glass. Hold plastic pom-poms loosely in one hand and gently smooth the rag along a small grouping of strands. Dampen a cloth rag with a small amount of water to clean holographic pom-poms. Hold strands loosely in one hand and smooth the damp rag along the strands. Turn a hair dryer on low heat or cold. Hold the hair dryer at least one foot away from the pom-poms and dry. Turn the pom-poms around often and shake while drying. Cut stained strands from the pom-poms. If you can't determine the type of material, contact the manufacturer for advice with cleaning. If you can find a purchase order pertaining to the pom-poms, it will list the type of material used in creation of the items. Store the pom-poms in a vented plastic container or athletic ball bag after cleaning. Storing the pom-poms in an airtight plastic storage container can cause heat damage and melting. Storing the pom-poms away damp will cause mildew. Do not allow the pom-poms in direct sunlight to dry, as this may cause fading or wrinkling of the pom-pom strands.